I have served the local, state, national, and international communities in several ways in the past several years. During this time, it has been my goal to have a world-wide outreach, sharing what I have been learning in the field of psychological science in ways that provide new information and strategies for a wide variety of people. One way that I have done this is through the work I have done on this blog. This site was developed in 2009 to begin to provide resources regarding child development, media and marketing, and the way they interact to parents, teachers, and others. I have also developed a podcast, Gender and Media Talk, that focuses on sharing research on gender and media with a popular audience. This podcast can be found on iTunes or through my blog. Since 2013, I have served as a founding board member of the Brave Girls Alliance (BGA), (see http://www.bravegirlswant.com). Through this organization, I work to lead professional and parent groups in advocating for healthy media for girls with a focus on the removal of gender stereotypes, sexualized, and objectifying images and narratives. I also engage in conversation at the international level regarding the health and well being of girls by working with groups such as SPARK Summit (see http://www.sparksummit.com). I partner with other members of the BGA to educate parents, caregivers, media makers, and women and girls about the negative impact of unhealthy media and marketing depictions through the development of curriculum and programming through national partners such as Hardy Girls Healthy Women and New Moon Girls (see http://hghw.org/offerings/webinars/). Since 2011, I have served as an Advisory Board Member to international girl empowerment programs, Shaping Youth, Toward the Stars/Girl Empowerment, & SheHeroes (see http://www.shapingyouth.org, http://towardthestars.com, http://www.sheheroes.org). As an advisory board member, I serve as a professional resource regarding child development, parenting, and research findings in reference to sexualized and stereotyped media. I provide guest posts for international blogs to share information with parents and other involved adults regarding the impact of sexualized and stereotyped media portrayals on girls. I also provide educational resources for parents and professionals regarding child development. My work has been featured on Yahoo Parenting, the Boston Globe, and the Christian Science Monitor, and in New York’s Social Media Week for Differences Magazine. This kind of national work has blended my scholarship with service, and allowed me to share my professional and scholarly knowledge with others in a way that is helpful. I have also worked to serve our local community. 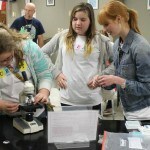 Since 2011 I have worked as the co-director of ACU’s STEM Day for Girls (see http://www.acu.edu/events/stem-for-girls/). The lower involvement of women in STEM fields is multi-factorial, and affects all communities, including Abilene. 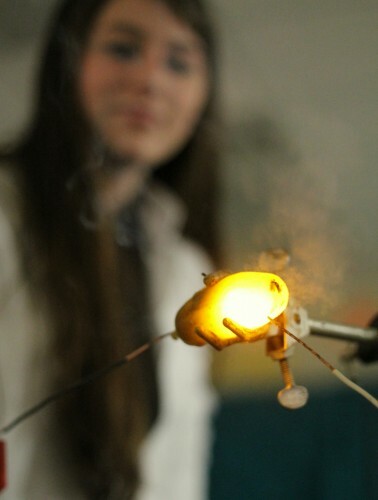 The local STEM magnet high school’s female student population has consistently been 30% or below, in spite of efforts to recruit female students. ACU has also struggled to increase the number of female students in our STEM fields such as engineering, physics, and computer science, where they are traditionally underrepresented. In recognition of the need for encouraging women and other underrepresented groups to pursue and persist in STEM (science, technology, engineering and math) fields, Dr. Sarah Lee and I started a STEM for Girls program at ACU. This program was developed in cooperation with Dr. Sarah Lee, a biochemistry faculty member. The STEM for Girls program exists to help students recognize career-relevant skills, broaden their ideas of what STEM fields are, and provide female and other underrepresented role models in STEM careers. At our first event (April of 2012), 34 middle school girls from the Abilene Independent School District came to the ACU campus to interact with professors in STEM. The faculty members were from diverse STEM areas, including applied fields (biology, biochemistry, physics, computer science and nutrition). Each faculty member planned a hands-on activity to perform with the middle school students. 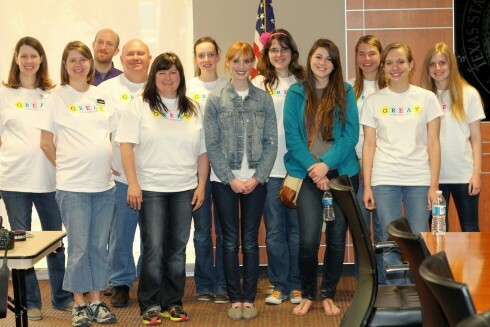 In addition to STEM faculty members, this event also utilized the help of many ACU undergraduate female students studying in STEM fields (greater than 15 each year), training them in the importance of outreach activities in order to effect social change. This morning event culminated in lunch at the student center during which the ACU undergraduate students sat with the middle school participants in order to share information about their own STEM and career interests and information about getting involved in STEM fields. Hosting the event on our campus was an important addition, as many of the participants had never been to a college campus before. 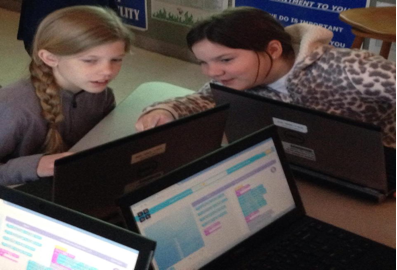 Our first STEM for Girls event was a huge success. While only a small percentage of participants knew a female scientist at the beginning of the day, it ended with 100% of the participants knowing a female scientist. Feedback from the community (including teachers and parents) was overwhelmingly positive. This program fills a void in the Abilene community, which has a high percentage of minority groups. The event has grown by 93% over the course of four years, and in 2015, we had 65 local girls participating. 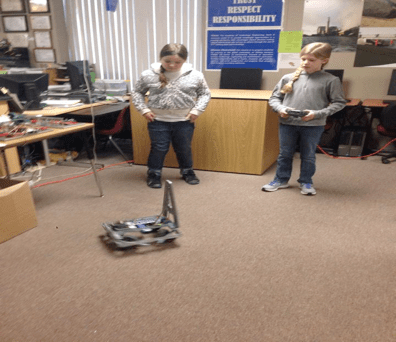 In addition to providing an encouraging experience for local middle school students, this event also served as an important time of connection and networking among female STEM students and faculty members. The organization of the university separates these fields into three different colleges, limiting our ability to interact on a routine basis. This networking opportunity serves as an important relationship-building event for women STEM students and faculty members. The ability to form relationships with other students and faculty members at a university is essential in retention of women in STEM fields. Through the STEM for Girls events, we have also seen an increase interest in promoting social change from our female students. So much so that a group of female students in physics and engineering started their own club, Women in Science and Engineering (WISE) and won an award from the Society of Physics Students to support WISE in working in the STEM for Girls camp each year. A few photographs of the STEM for Girls program over the past four years are included below. This program serves as a remarkable way to involve our students in social change in a way that serves both our community and addresses the larger social issue of underrepresentation of women in STEM fields. As one of the founders of this day camp for middle school girls, and the co-director, I provide leadership in organization, promotion, and management of a one-day event promoting the STEM fields for middle school girls. I also coordinate university and high school STEM faculty and students in developing activities, acquiring materials, and operating stations to provide hands-on experiences in science, technology, engineering and math. I collaborate with community and university leaders in the STEM fields to provide funding for materials for activities and food and t-shirts for participants. I work with my co-director, Dr. Sarah Lee, to lead a multidisciplinary program of faculty members and enlist the support of volunteers and collaborating with businesses and community groups. As a part of this process, I cultivate relationships with local and regional school districts in order to work with AISD’s ATEMS high school and to recruit participants from local middle schools. As the co-director, I contributed to growing participation by 93% in three years through development of relationships with local schools and creation of processes for recruitment. My service work has been of primary importance to me over the past several years as I’ve shared what I’ve been learning through my own research regarding the systemic issues that keep underrepresented populations, such as women, girls, and racial minorities, from achieving to their potential. As I’ve completed more research on this topic, it has made me more determined not just to share my knowledge and strategies that promote equity with my own students and on the ACU campus, but with an extended audience that provides a national and international reach. The more opportunities that I can provide for people to learn and grow, the more I have the chance to make a true positive impact on the world. I’ve also brought these social justice conversations into the classroom, and they have shaped my ability to talk with my students about how we can use our knowledge and skills to make a difference in the world. At ACU, we talk a lot about our mission to help our students become Christian servants and leaders throughout the world. My efforts to provide service to the national and international community allows me to show my students a concrete way that I can use my professional skills to do just that. I use that example as a way to prompt them to begin to think about their own gifts and skills and the opportunities that they have to use those to be a change maker in the world.